One of Sir Walter Scott’s creations has been much in the news lately: his country house at Abbotsford was formally reopened to the public by Her Majesty the Queen on 3 July 2013, following a £12 million restoration. Abbotsford looms large in recent accounts of Scott as (in Stuart Kelly’s phrase) “the man who invented a nation” — the Romantic Scotland of tartan-swathed Highlanders that still enthralls the popular imagination, two hundred years after Waverley and The Lady of the Lake. For much of the twentieth century critics and historians denounced “Scott-Land” as a garish anachronism, woven from a tissue of anachronisms, the fantastic fabric of an ancient nation draped over the real one. Abbotsford, Scott’s gas-lit “Conundrum Castle,” was its architectural confection, a misbegotten attempt at feudal revival in an industrial age. The relics with which the house is crammed (Rob Roy’s gun and sword, Prince Charlie’s quaigh, the door of “The Heart of Midlothian”) transform the object-world of Scottish history into a jumble sale of props from its author’s fiction. Now that the Union is relaxing its grip on Scotland, the disavowal of Scott no longer seems a necessary rite of nationalist passage. A more tolerant, curious, even appreciative interest in his achievement is emerging, even if Abbotsford and other spectacular artefacts of the “invention of Scotland” (George IV’s 1822 state visit to Edinburgh, stage-managed by Scott; the Scott Monument on Princes Street) overshadow the poems and novels that made him the most famous author of the nineteenth century. Today, after a long hiatus in which those poems and novels dropped out of print, we are well placed to rediscover the originality — the imaginative audacity and experimental strangeness — that once took the Atlantic world by storm. Scott was not most celebrated for his Scottish fictions, wildly popular though they were. The man who invented a nation didn’t stop at one but went on to give the English their idea of England too, in Ivanhoe, his glittering romance of the twelfth-century greenwood. Ivanhoe installed a myth of national origins that still conditions the popular idea of the Middle Ages: Robin Hood, the Black Knight, Richard the Lionheart, boozy monks, sinister Templars, they are all there. Some have found Scott’s medievalism as objectionable as his tartanry. Professional historians were quick to point out the novel’s errors and anachronisms, from details of costume and weaponry to its grand theme, the colonial antagonism between Normans and Saxons, and its pastiche of antique English, the most brilliant stylistic experiment in British fiction before Joyce’s Ulysses. But Ivanhoe is “A Romance,” as its subtitle promises, not a historical treatise. Its errors and anachronisms are knowing rather than symptomatic. They do creative and critical work. Take the Jews, Isaac and Rebecca, Scott’s treatment of whom disrupts the novel’s official story of the foundation of English upon a reconciliation between alien races. Triangulating the opposition between Saxon and Norman, the Jews dismantle it — revealing both as bloody-minded Anti-Semites. Scott makes Rebecca by far the most admirable character in Ivanhoe. She embodies chivalric and Christian virtues more convincingly than any of the novel’s warriors and clerics, even as she resists a series of attempts to convert her to Christianity. Scott dramatizes her resistance as principled, even heroic, an eloquent refusal of the universal history (of Christianity’s digestion of its Jewish heritage) that underwrites the national history of assimilation. At the close of the novel, Ivanhoe and his friends look forward to a happy domestic settlement, while Rebecca and her father prepare for an exile that will transport them not just in space but in time, three hundred years into the future, to the court of “Mohammed Boabdil, King of Granada” — Abu Abdallah Mahommed XII, last of the Nasrid Sultans, who surrendered his kingdom to the Catholic Monarchs Ferdinand and Isabella in 1492. The Reconquista meant the final expulsion of the Jews from Spain as well as of Muslims who would not convert to the new order. Scott’s audacious anachronism reminds us that further cycles of dispossession await Rebecca and her people — a dispossession Scott’s readers should have recognized as reaching into their own historical present. At the same time, Rebecca speaks for an ecumenical ideal of tolerance and magnanimity that none of the Christians in Ivanhoe can live up to. Through her we glimpse another kind of history, one very different from the English destiny of compromise and settlement: a radically unsettled, unfinished history, of worldwide dispossession and wandering, but also of utopian aspiration and humanist hope — the products, it seems, of that very condition of dispossession and wandering. The union that ends the novel seems smaller in every sense, lacking spiritual grandeur, than the sublime horizon that opens around Rebecca. Readers who wished Ivanhoe had married Rebecca rather than the fair Saxon Rowena, and rewrote the end of the novel to satisfy their preference, were not being perverse. Scott baits the end of his romance with a yearning that cannot be assuaged by any literal rewriting, since it occupies the gap between a universal ideal of human possibility and what a contingent, merely national history can afford. The most imaginative treatments of that yearning would be by George Eliot, who makes withheld unions — between Dorothea and Lydgate in Middlemarch, between the Christian Gwendolen and the Jew Daniel in Daniel Deronda — structurally central to her great novels of the 1870s. As for the gap: wishing, Scott’s novel insists, will never close it. 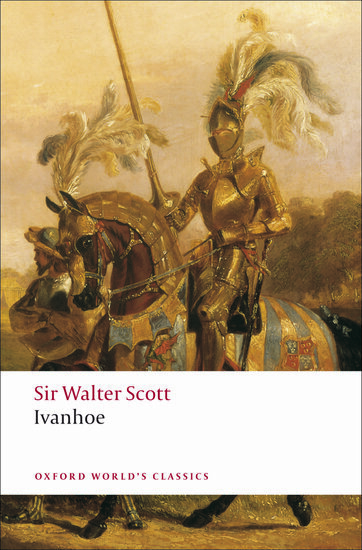 Ian Duncan, Florence Green Bixby Professor of English at the University of California, Berkeley, has edited Scott’s Ivanhoe and Rob Roy for Oxford World’s Classics. His edition of Robert Louis Stevenson’s Kidnapped will be published next year. For over 100 years Oxford World’s Classics has made available the broadest spectrum of literature from around the globe. Each affordable volume reflects Oxford’s commitment to scholarship, providing the most accurate text plus a wealth of other valuable features, including expert introductions by leading authorities, voluminous notes to clarify the text, up-to-date bibliographies for further study, and much more. You can follow Oxford World’s Classics on Twitter, Facebook, or here on the OUPblog. Subscribe to only Oxford World’s Classics articles on the OUPblog via email or RSS.